Well, people, if you've been reading this blog you know much of my time this fall has been spent at a blur of galas, dinners, and events. There have been so many, and all so spectacular, that every time I am sure nothing can top the one that has come before. I leave thinking "well, that's it then, there can't be one better than that". However, I kept hearing things about the annual Keyano College Foundation Gala - things like it being "the" gala every year. "The" gala where you wore a long gown, and had hair and make-up professionally done. "The" gala where the food (catered from the Sawridge) was impeccable, the atmosphere incredible, the entertainment astonishing, and the entire experience beyond compare. I decided that I needed to attend "the" gala, and when tickets were available for sale I quickly snatched up enough for myself, my husband, and my closest friend. 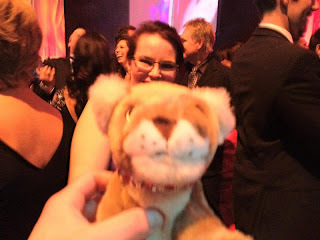 Another friend was instructed to purchase his own tickets, and soon enough we all had our tickets in hand (although in the end Keyano was kind enough to issue me a media pass, which meant I could pass my ticket along to a new friend so she could attend "the" gala, too). I awaited the event anxiously, even doing a pre-gala walk-through of the Syncrude Sport and Wellness Centre with Keyano director of marketing and communications Russell Thomas (and returning once on my own in subsequent days to watch the transformation progress, which I will write about later this week). When the day for gala arrived I was past excited. I had an appointment to have my make-up done by fabulous local make-up artist Hina Khawar. My friend, who is very talented with hair, had agreed to do my hair. And I had a gown that had never been worn in Canada, a designer gown I had purchased in England and worn only once at an Irish castle for a black-tie New Year's Eve gala. I was ready, I thought, for "the" gala. I arrived with my entourage a bit early as media was requested to do, and felt a little guilty about leaving them outside in the cold when I was allowed to enter (and here's a hint to organizers - perhaps at the very least there could be heaters outside for those guests who arrive early and don't wish to pay for their cabs to idle while they wait for the doors to open - it's a small courtesy but one that I think would have been appreciated on a cool November evening). When I walked inside, though, all thoughts of the cold outdoors were left at the entrance as I realized the entire facility had been transformed. From the entry table to the field houses the entire facility sparkled. The coat check was being manned by Keyano nursing students, which I thought was a terrific way to involve them in the festivities. 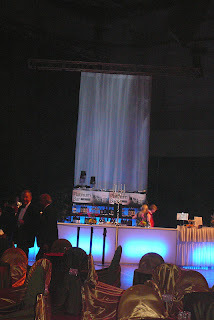 There was a champagne bar at the entrance, just the right start to what was promising to be an amazing evening. When I was asked if I would like to take a pre-opening look at the field houses I leapt at the opportunity to see them before they became crowded with all the guests - and what an astonishing sight. The first field house had been set up with tables and chairs, zebra print sofas, and large screens so those in this room could watch the action in the room next door. There were food stations everywhere, and bars, of course. There were candles and flowers, ice sculptures and fabrics softly draping the field house, changing it from a sports facility into something else - into a very swanky cocktail bar, in fact. The next field house was perhaps even more astonishing. 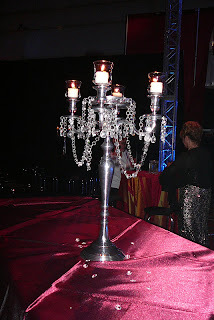 Here the tables and chairs were wrapped in shiny fabric, with tiny details like rhinestone accents. 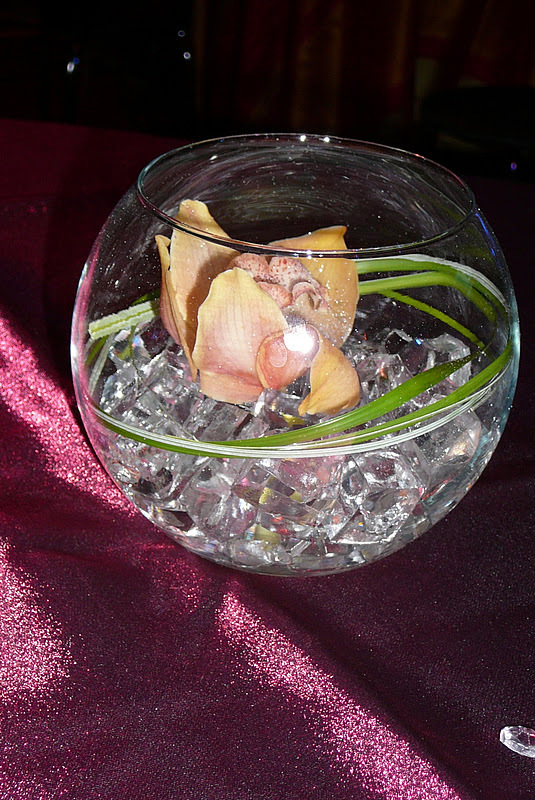 The tables were strewn with small crystals and floral arrangements. 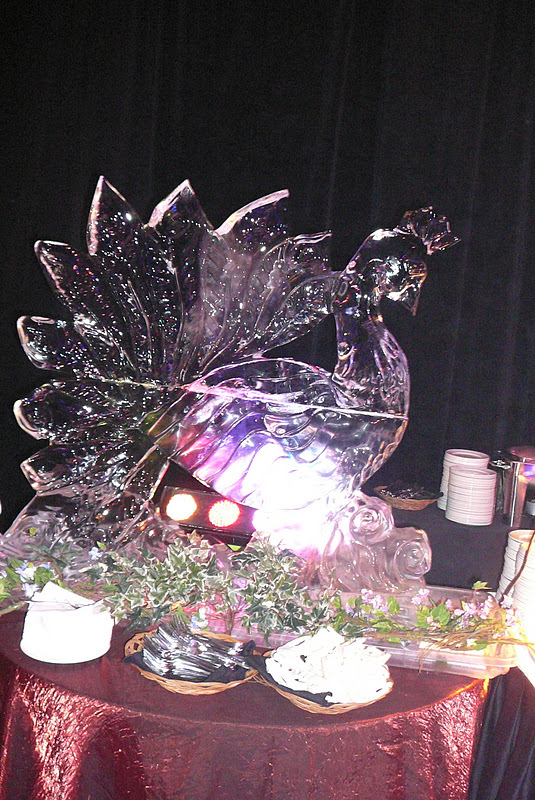 There were food stations and chandeliers, wine bars and cocktail bars. There was also a stage, and a dance floor (which, as it turned out, would be where I spent most of my evening). Once I had completed a quick tour I returned to the entrance to find my somewhat frosty entourage, and I took them on the tour I had just done. 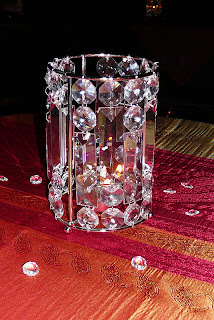 We walked through the hall with champagne glasses in our hands, gazing at the silent auction items and marvelling at the decor. I showed them the first field house, and then we moved on to the second where we secured a table and settled in. Quite quickly we dove into the food, finding an array of sushi, cheese, crackers, and fruit at the table closest to us, and at other tables scattered around the room an incredible variety of delicacies (and, most importantly, desserts). 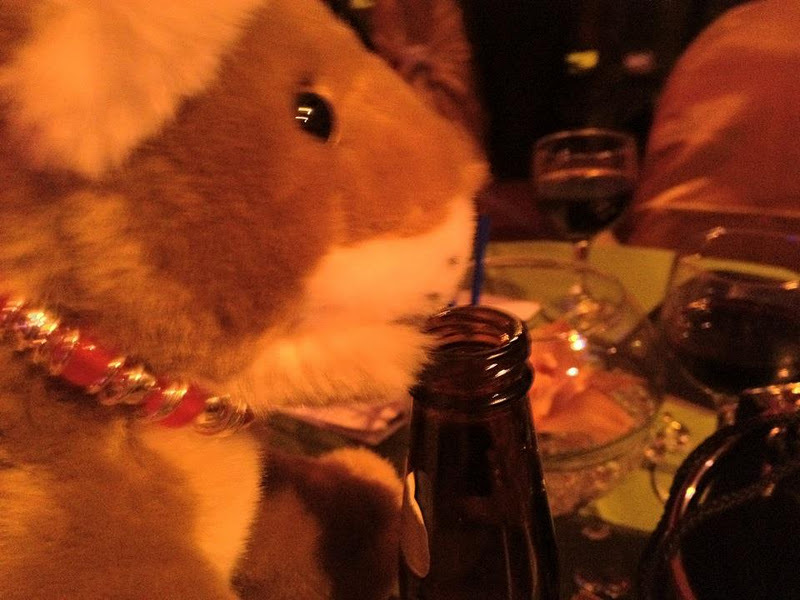 We also began to dive into the beverages, quickly determining which bars served which items. By this point guests had been steadily flowing into the field houses, and it was becoming quite busy (although surprisingly not crowded, given the presence of 1200 guests plus staff and volunteers). The official program began with a recognition of all the sponsors, those who make this kind of event possible. Without the sponsors this event would be impossible to host, and so the recognition of the sponsors is simply a reminder of those businesses and individuals who contribute so much to our community with events like these. 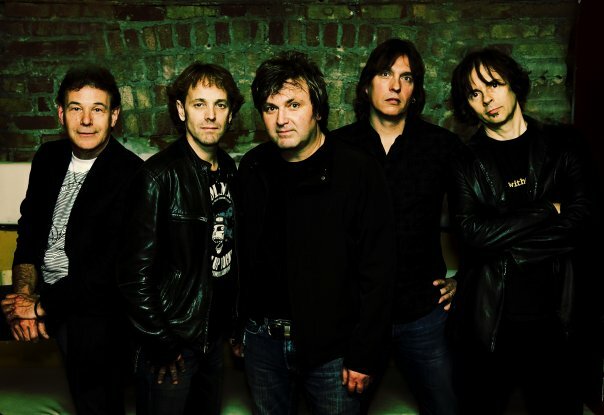 Once the speeches were done it was time for the first band to take the stage - Honeymoon Suite. Now, without telling you my exact age I will admit that I danced to this band when I was in high school. They were very popular at that time, and no school dance was complete without "New Girl Now" being boomed out of some terribly inadequate sound system. When they took the stage I flung myself into full concert mode - which in my case usually means hitting the dance floor with a vengeance and not relinquishing it until the band has left the stage. As a personal aside I spent much of my twenties spending time with musicians and thus I know how they appreciate a responsive audience. To some extent the performance of a band is dependent on the audience, and a lacklustre performance can come from a disinterested and disengaged audience. I am one of those who sidles up in front of the stage and makes eye contact with the musicians so that they know they are connected to those watching. I find some individuals are better at establishing this bond, and I was delighted that the keyboardist and I quickly developed a rapport with our eyes alone. At one point a young woman dancing next to me began to struggle a bit with a strapless dress that was threatening to expose a good deal more than she intended. I believe the keyboardist had noticed this as well as he looked at me, raised his eyebrows sky-high, and we both burst into giggles and smiles, he on stage and me dancing down below. I danced and danced (taking brief breaks for a drink or two), my dearest friend often accompanying me on the dance floor. Then, when they played their final song, I danced one last time. When the set ended the keyboardist (Peter Nunn) stepped to the edge of the stage and beckoned me close. He took my hand, thanked me, and told me that I was "inspiring". I in turn thanked him and told him he was very sweet. These are the moments unforgettable evenings are built on, people. When I danced to "New Girl Now" it was like being swept almost 30 years into the past, into a time when I was a much different person, and to be thanked for dancing was like being thanked for breathing - because truly what could I do but dance when encountering a band with such a connection to my history? 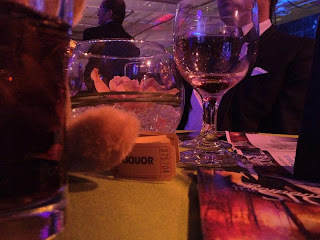 After I returned to my table the live auction was about to begin, and once again local Ross Jacobs burned up the stage. Ross just has this way of driving up the price, although people didn't need to be driven very hard. The items being auctioned - trips, artwork, signed guitars, and the rest - were hotly contested items. The one that caused the most excitement was the trip to LA to spend a day golfing with Marty McSorley - and it didn't hurt that Marty was there in person to help sell the idea. My dearest friend gasped when she heard he was in the crowd - while I am not a hockey fan she is, and she was thrilled to know Marty was there. The trip with Marty eventually went for an astonishing $50,000, an amount that seems almost beyond fathom and yet, there it was. When all was said and done the live auction raised a phenomenal amount of money for the Keyano College Foundation, and once again it was a testament to the generosity of this community. The final numbers place the total amount raised from the evening at half a million dollars - a staggering amount by any measure, but totally within the expected range in this giving, generous community of ours. 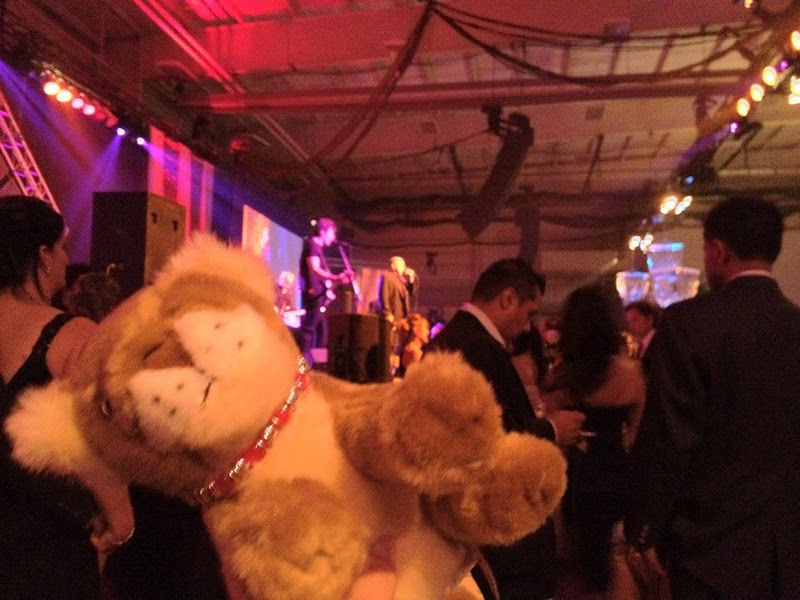 After the live auction my friend was delighted to have her photo taken with Marty and my husband and I took the opportunity to thank him for making the trip to Fort McMurray. I may not be a hockey fan but I'm a fan of anyone who makes the trek north to our community, especially in the name of a good cause. After the auctions and raffles ended the next band took the stage - Streetheart. Again it was a blast from my high school past, but this time the dance floor was far more crowded with guests who had by this point also reached full concert mode. 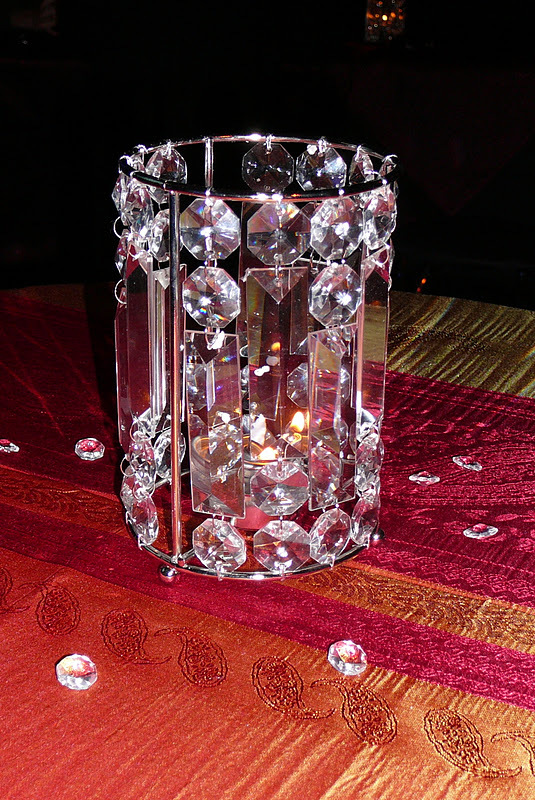 At various points I managed to secure a small spot on the dance floor and dance again, but by now my feet had begun to tire and I was more interested in chatting with friends I had begun to spot around the room. By this point, too, our photos had begun to descend into some degree of silliness, with a small stuffed lion figuring prominently in most (the lion was from one of the raffles, and he too had an eventful night of beer drinking, dancing, and general merriment). I must admit that after Streetheart finished their set we stayed on for a bit longer, dancing until the bars closed. By that time, though, my entourage and I had drunk enough, eaten enough, and danced enough. My glittery silver sandals had long since been kicked off, and my thoughts began to turn to home. We gathered together, my friends and I, and set off into the frigid night to find a taxi. Imagine our astonishment when out front there was a stretch limousine available for hire! 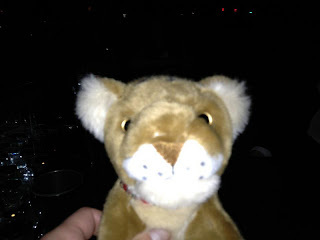 My husband, always the sort to want to end an evening on a fitting final note, hired the limo on the spot, and thus the ride home was as luxurious as the gala had been (and the final photo of the night shows a small stuffed lion in a limo). Sunday, people, I awoke tired and, admittedly, slightly hung over. My feet appeared mildly swollen from all the dancing, and I craved peace and quiet. But all day I kept thinking about moments from the gala and grinning. Moments spent dancing to Honeymoon Suite, and having Peter, the keyboardist, say such kind and flattering words to me. Moments with my closest friend when we laughed and danced. Moments with my husband when he joined me for a slow dance or two. 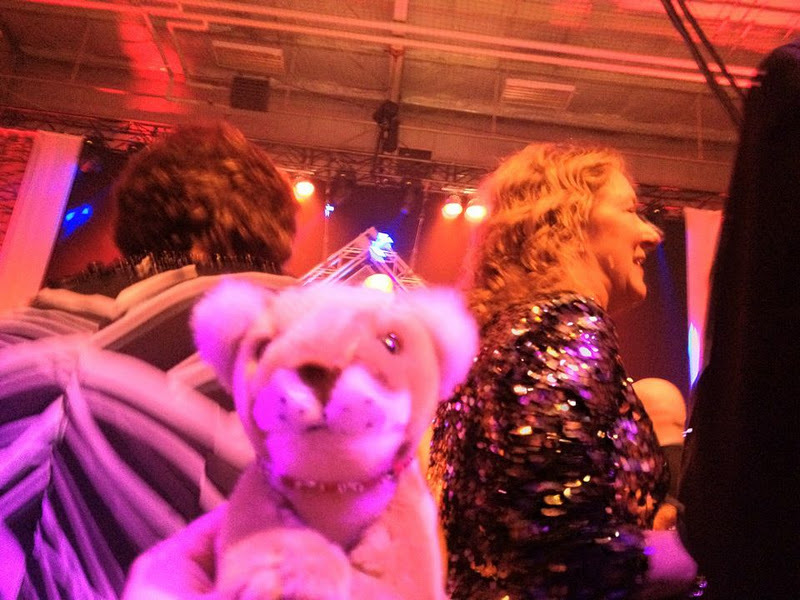 Moments when the dear friend I refer to as "the brother I never wanted" would take yet another photo of a stuffed lion popping up somewhere unexpected. Moments when the crowd went crazy during an auction. Moments when I made introductions between new friends and old ones. Moments when I waved at someone I knew, or shared a joke, or convinced someone who was unsure to join me on the dance floor (and people, I'm a very convincing sort - and rarely refused in such requests). Those moments that have kept me smiling all day are the moments that make memories you will never forget, memories you will carry with you for your entire life. Those moments are so rare and so precious, and I find I cling to them with a certain degree of ferocity because you don't know when those moments will come again. For me, though, I have a pretty good idea of when those moments might recur. 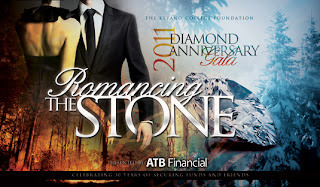 I rather think they will return next year, for the 2012 Keyano College Foundation Gala - because people, I think this gala, THE gala of the year, is the time when those moments are repeated, year after year, decade after decade. 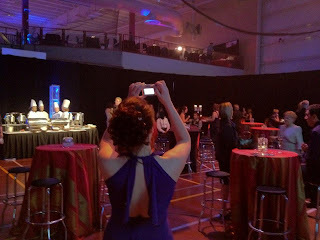 And what I know is this : the first taste of those moments has made me desperately hungry for more, which is why next year, in 2012, I hope to see all of you at THE gala of the Fort McMurray social scene. These are moments that are, quite frankly, too special to miss. I am very inspired of this blog. You are truly a one of a kind writer. I admired you a lot. Nice (and quite rare) to learn the thoughts, so eloquently expressed, of a beautiful stranger I happened to see eye-to-eye with, quite literally, at a show. You are so right about how a band's performance is influenced by their audience, and I must thank you once again for the great vibes you sent our way!